As with CRM, project management can have a far-reaching influence in your organization, so you want to think about how you set it up before you start using it. When many people work together on a project, the complexities of managing who should do what and when can be daunting. Even when one person works solo on a project, software aids in putting all the moving parts into easy-to-manage compartments. Each project has a start and end date, representing when planning begins and when the wrapping up is complete. Between those dates, tasks should be done and milestones represent significant accomplishments. The image below shows a summary of ongoing projects. It gives a high level overview of the long-term work a team is collaborating on to complete. A commonly used chart in project management software is the Gantt chart. It’s a visual representation of the project, with tasks and milestones shown as component parts to that project. Dependent tasks — a task that can’t start until a previous task is completed — are depicted with arrows connecting them. It’s a good management tool for tracking progress within your project. The same projects on a Gantt chart. Building your project is not something usually done by a single project manager. Most projects involve several people working together as a team. If you’re working on a project for a customer, that customer must also be involved in the initial scoping of the project. The first phase of any project is to define the requirements (the what) of the project — what must be accomplished, and by whom? The better you can define your requirements, the less ambiguity happens as the project progresses. Ambiguity causes people to make assumptions. It also causes people to take shortcuts to save money, often to the consternation of the customer, with ensuing arguments. Every project has start and end dates. The project also has individual tasks, each with their own deadlines. The more you can define realistic dates, the less worry about overrun you have. If your dates are not realistic, and you overrun, it may impact the rest of the project. With accurate dates for projects and tasks, you can allocate resources to accomplish those tasks. When individuals know when they’re needed ahead of time, you don’t have to worry about a different project taking priority or competing for the same resources. When a project relies on a task to be complete before the project can progress, that task lies on the project’s critical path. The critical path of a project is very important to accurately budget a project, as mistakes directly impact the date the project is completed. Tasks within projects are specific activities that must be accomplished to complete the project. While many people may work on a task, each task should have a person in charge. That person is accountable to the project manager if that task is not completed on time and within budget. Project management software lists the tasks and person in charge of that task, along with other important details. Each task has a start date and an end date. These dates may be fixed dates, or they may be dependent dates as a part of another aspect of the project. For example, a task start date may occur the day after a previous task is completed. Dependent tasks are more flexible, but may cause problems with resource allocation if a fluid task starts on a date different from what is expected, and resources have been given to another task. Integrating your CRM with your project management system means you can see project tasks right in the CRM record. By putting your own employees in the CRM, you can track their tasks along with other CRM activities they’re assigned to complete. Managing people is much easier, as this data is consolidated into a single place. Categorizing the work done in a project helps with setting billing rates and reporting. If you do contract work for customers, you likely bill a category of work at a specific rate. Categorizing tasks and having your labor bill against those tasks in that category makes it easy to invoice clients. : A simple categories manager. 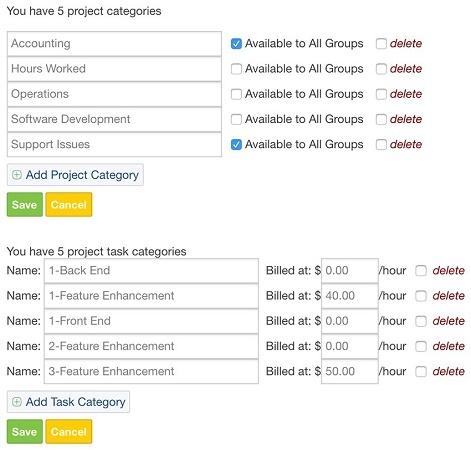 For example, you can set up categories of tasks for your team based around the kind of work they do. If you manage an advertising agency, you have people on your team who do graphics, HTML, and strategy. Each category of work is done by different kinds of people, all collaborating on a bigger project to serve a client. Reporting on the number of hours spent on each category of work is important for the client to see, as well as for your own internal project management. Categorizing also allows you to create reports by category. You should be able to see what your labor utilization rates are by category. It’s important to measure how much of your team members’ time is spent on projects, so you know if you’re spending money on labor appropriately.